Purple Sweet Potato gives a slight mutation from the authentic Gulab Jamun. Layers of rich, unexpected flavors and color makes this delicacy a succulent Indian treat that melts in you mouth. It is a wondrous way to sneak in some goodies especially on special occasions. A perfect festive delight to feed your loved ones or for give aways to your near and dear on this Diwali. Gulab Jamuns are usually made with Mawa or khoya which is nothing but evaporated milk solids. 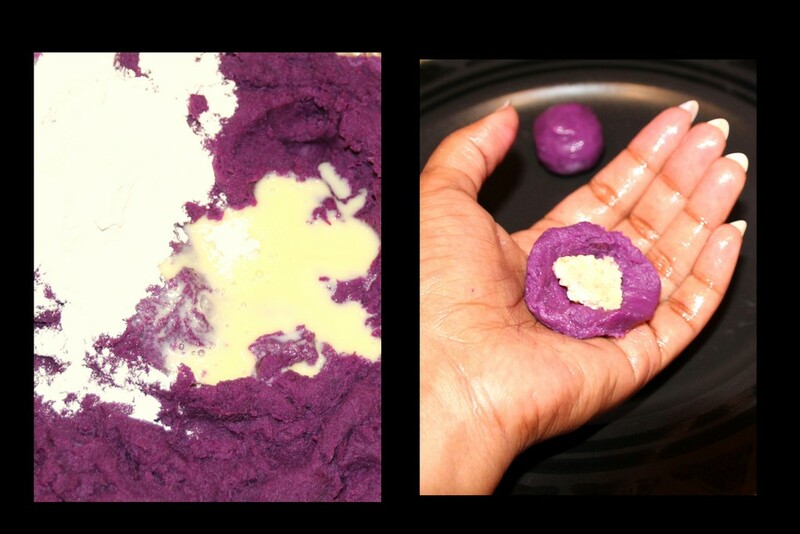 Mashed purple sweet potato is the main ingredient in this recipe. These sweet potato darlings are stuffed with homemade fig mawa/ khoya made with Ricotta cheese and Fig to add more flavor and irresistible. Cut the sweet potatoes into large chunks and steam them in a pressure cooker or a steamer for 10 minutes. Cool and peel to mash with potato masher or puree it in a blender to make it fast. You may add approximately a tablespoon of water or as required to blend it. To this add the evaporated milk, all purpose flour, salt and knead to a soft smooth dough for about 5 minutes. For the Fig Mawa/khoya, in a large pan add the ricotta cheese and stir well in medium heat. It will turn into soup consistency and then start to evaporate the water to transform into milk solids. This will take approximately 15 mins. Now add the evaporated milk or sugar and the mashed fig. You may remove the fig seeds by running through a sieve. But I prefer to leave the seeds in. Stir until it solidifies. In a large sauce pan, add the water, sugar, and bring it to a boil and simmer for few more minutes until it thickens to a syrup consistency. Now add the rose essence, or rose milk syrup and cardamom powder. Turn off the heat and set aside. Now is the time to make Jamuns, take small portion of the dough, about half the size of amla (indian gooseberry). Flatten it slightly and place a small quantity of fig mawa in the middle and roll it into a smooth ball. Heat the Ghee and oil in a kadai for deep frying. Gently drop the jamuns and fry in medium heat until it turns brown. Since the sweet potatoes are purple colored, a rich reddish brown color is what we will see. Now drain them and place it on a paper towel lined plate or container to cool. Since these jamuns are delicate darlings, adding them to the sugar syrup immediately will break the jamuns easily. Let them rest for 5 mins before you transfer them to the sugar syrup to soak for half to 1 hour maximum. Serve them at room temperate or chilled with some chopped pistachios as garnishing. Evaporated milk gives the necessary sweetness and moisture to mash the potatoes well. You can substitute it with cream/milk as required along with 2 tablespoons of powdered or confectioners sugar. Ghee adds more flavor and richness to any indian dessert, to deep fry I have modified the ration of ghee and oil to 1:2 to incorporate the ghee flavor and aroma. If you want to eliminate the mawa/ khoya procedure, you may buy the mawa at any Indian store and add the pureed fig and required confectioners sugar and mix well. Always fry the jamuns in medium to low heat only. Do not stir the jamuns as soon as you drop them in the oil/ghee for deep frying. Allow the other layer to get crisp before turn them to avoid breaking. Good for 1 week when refrigerated. Are you in the mood for a nipping and bubbly refreshment? Naturally flavorful and delicious Blueberry Infused Fizz is a wonderful departure from mundane juice blends to a fizzy concoction of goodness that will cool you off. You can enjoy this lip-smacking bevy blends of two flavors that dances across your tongue. Freshly Squeezed Apple or Celery along with infused blueberry and ginger will knock your sock off. "Snapple" (Soda-Apple) is sweet and slightly sharp due to the infused ginger and berry. "Celda"(Celery-Soda) Blueberry Infused Fizz has a sharp, spicy and peppery taste yet a bit of sweetness from rock candy/sugar (crystalized cane sugar) is fascinating. You may pick your choice of flavor according to your taste buds. Both versions are exquisitely refreshing and a fantastic recipe for kids and teetotalers. You will need at least 12-24 hours for this comfort drink to infuse at its best. As I enjoy berry bits in my drink, some blueberries are punctured or gently crushed and incorporated into this thirst quencher. For garnishing I skewered few berries and rested them on top of the cocktail glass. This beverage can be prepared in advance and kept chilled. Whether you are brunching, picnicking or be it any occasion that needs a special drink; this perfect blend of flavors will compliment the natural goodness that is made from earth's best stuffs (organic produce). 1. Wash the apples or celery well and freshly squeeze the juices out. 2. In an infuser or a mason jar, add the cut ginger, slightly crushed or punctured blueberries, chia seeds and about 1-2 teaspoons of rock sugar/candy. 3. Close the jar and refrigerate it for 12-24 hours to infuse. You will note the change of color. 4. Add ice cubes if you desire and top off with ginger ale or club soda. 5. Garnished with blueberries, mint or lemon wedges and serve immediately. Apples must be cored before adding them to the juice maker. If you have difficulty finding rock candy/sugar the best substitute will be a natural sweetener like raw honey. Avoid processed sugar. The ginger can be cut into fourths or just give it a whack in order to it release its flavors easily. For more twists you can add mint leaves or lemon wedges just 2 hours before serving. For parties or any large gatherings, simply buy store bought organic apple juice to make work easy. Slowly but surely I reached my 50th post:) Wish me luck! Cheers!! Happy Ganesh Chaturthi to all readers celebrating! 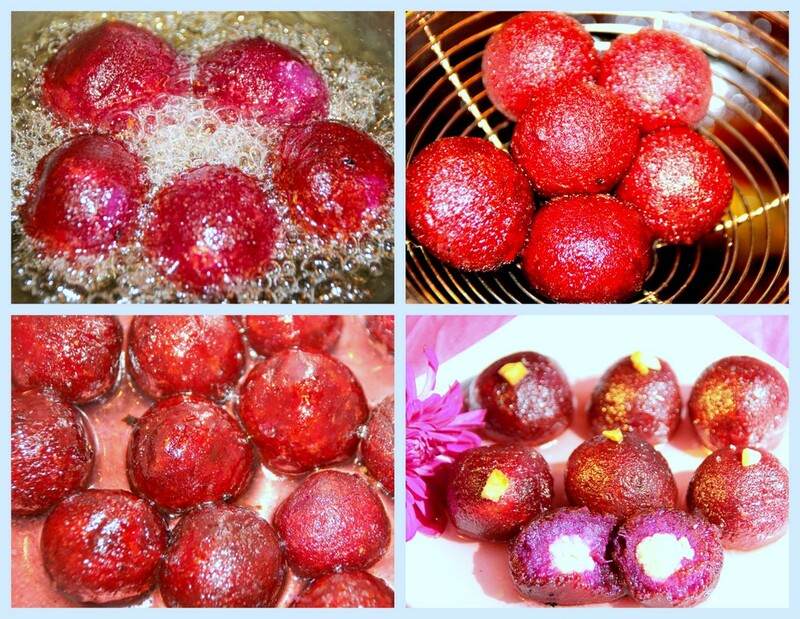 Kozhukattai/ Modak is an easy sweet/ savory dish that is prepared mainly on Ganesh Chaturthi. Being a Labor day long weekend, we Indians residing in America gets to celebrate this special occasion in an elaborate manner. Lord Ganesha is born in our home this year. An incredible activity to involve kids to enjoy as we create an eco-friendly (edible) idol to celebrate Lord Ganesh's Birthday. We made the idol using rice flour (dough) and decorated with pulses and lentils. Be wary, as it dries it doesn't withstand for long. Lesson learnt to use clay on our next to preserve the idol to a certain extent. Kozhukattai/ Modak being Lord Ganesha's favorite is offered as prashad on his day. I have 3 different delicious versions that are easy to make with assorted shapes here. The coconut stuffing and the spicy kozhukattai is inherited from my grandmother who passed it to my mom and now to me. I came up with the sesame and nuts stuffing. The authentic elaborate method to make kozhukattai is quite time consuming. The soaked rice is ground like idly batter and then cooked in a pan for close to 10 mins. To prevent lumps continuous stirring is required until right consistency - soft and smooth dough. But for the past few years I picked up the easy version of using idiyappam flour, which even bachelors can enjoy making these effortless kozhukattais. Trust me you can never go wrong with this method of preparation. Enjoy shaping and hogging! Dry roast the nuts and the sesame seeds until aromatic. Grind to a fine powder. To this add the brown cane sugar powder and cardamom powder, mix well and set aside to use as stuffing. Mix all the 3 ingredients together and set aside. You may fry the grated coconut in ghee if you prefer. 2. Grease your palms and divide the dough into small balls. I also divided them for all three versions. 3. Use a ziplock or banana leaf (greased with oil) as a base to make the desired shapes effortlessly. 4. Flatten the ball into round shape using greased finger tips and in the center add about 1/2 teaspoon of your desired poornam and make any shape you like. Make sure the seams are closed well and no cracks are visible. 1. Heat about 1 teaspoon of oil and add the mustard seeds, urad dal, channa dal and allow it to splutter. now add the green chillies, asafetida, salt, curry leaves and remove from heat. 2. Now add the coriander leaves and tennis ball sized dough (for approximately10 spicy kozhukattai). Mix well. 3. I usually place a small ball of dough (gooseberry size) in between my 4 fingers and palm. By giving it a gentle press/squeeze to get the spicy kozhukattai shape. 4. Steam as stated above for 10 minutes. 1. Make sure the steamer basket/ idly pan has at least 2 inches of boiling water and also check if the water is below the idly plate or steamer. 2. There is a quick fix if the dough seem to get dried, or if it breaks or cracks while shaping. Sprinkle some warm water to the dough and knead again until a soft and smooth dough is formed. Vola! Also keep the dough closed while preparing the kozhukattai. 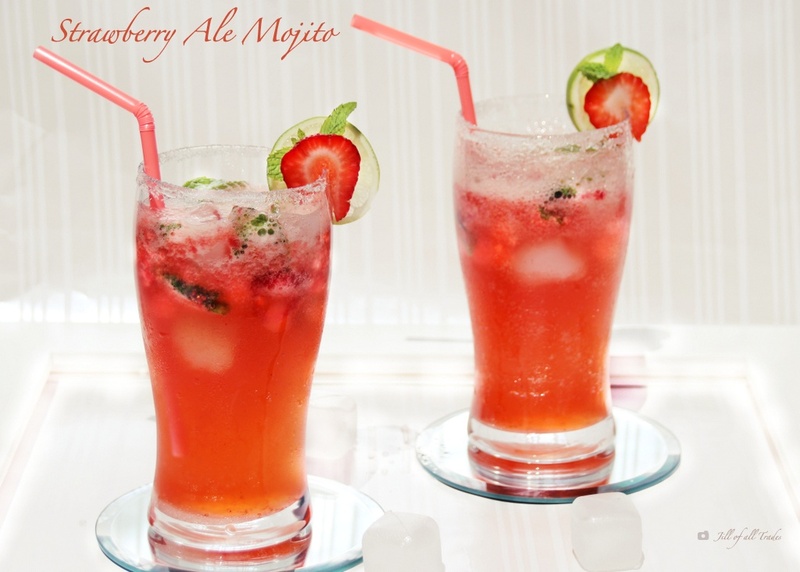 Begin your day with a glass of extremely potent, refreshingly tasty and rejuvenating mocktail. Whether or not cleansing is your thing, this healthy juicing recipe will aid in nourishing and gets rid of the toxins from your body. Even kids would enjoy this exotic combination and would get full benefits of its vitamins and minerals. Don't be surprised if they thank you for such a palatable and refreshing drink. Celery being the base for this juice is little known powerhouse. It's loaded with potassium, folic acid, magnesium, calcium, iron, phosphorus and essential amino acids. It also provides dietary fiber with low calorie weight loss diets. Get full benefits of its fibers and minerals. This vitamins rich celery contains a neutral taste and does not possess any palatable appeal. The apples just do the trick with its sweeter touch to increase the celery's palatability. Apples help-regulate detoxifying enzymes and contains anti-inflammatory properties. Green apples are ideal for this drink, if unavailable, the best reds to substitute are Fuji and Gala. Granny Smiths is naturally low sugar and is great for juices. Amla or Indian gooseberry is highly rich in Vitamin C and packed with minerals like iron and zinc. This humble fruit benefits the circulatory system, purifies blood, detoxifies the body, and strengthens the immune system. Amla can definitely keep a number of diseases at bay. Parsley can help stimulate bile production that can help with detoxification process. Its folic acid clears out the uric acid in joins to relieve from pain. Ginger helps benefit with detoxification process, improves digestion and its rich in antioxidants. Limes deserves to be in the limelight for its remarkable healing properties. They are great detox and known for weight loss, cold preventives, antibiotic properties, vitamins, minerals, alkalizing, anti-cancer etc. Core the apples and cut into quarters. Deseed amlas and peel ginger root. Add all the ingredients in a blender and blend well. I prefer a blender for a juicer to keep all of the nutrients and fiber of the fruits and vegetables. A great way for picky eaters especially kids to intake some naturally grown fresh produce. Who does not love sweet, spicy and tangy Chat? Khakhara Dahi Chat is an easy and healthy snack that can be made in a jiffy. 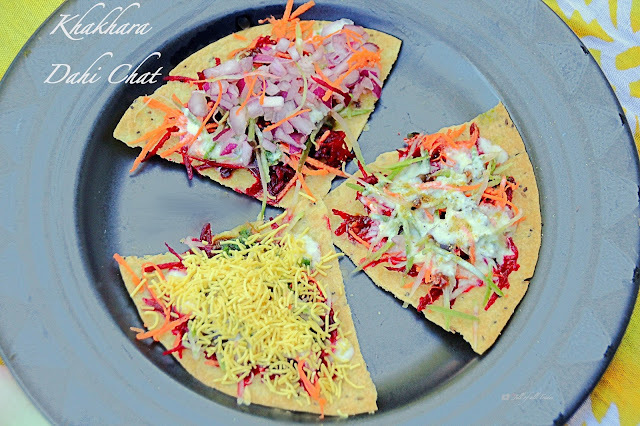 Chat is a popular street food in Maharashtra, India. My favorite Dhai Poori and Dahi Papadi chat urged me try a quick and nutritive version to satisfy my cravings. Used store bought Khakhara as the base for this chat. Khakhara is a traditional Gujarati healthy snack. It is crispy, light and deliciously flavored with different masalas to pick from. It's usually cooked on low heat while continuously pressing the flattened dough (roti like) using a wooden press, potato masher or a folded cloth until it becomes crispy. It is readily available in Indian grocery stores with its different flavors. If you are planning to pick one, find for the one which is vacuum sealed which retains its freshness. Sweet Dahi/ yogurt gives this chat more flavors to the already tangy tamarind sauce and the spicy mint sauce. This light and flavorful snack contains freshly grated raw vegetables. Minimal cooking is required to prepare the sweet and tangy sauce. This sauce can be refrigerated and stored in airtight container for couple of weeks. Khakhara - 1 pack (Vacuum sealed, your choice of flavor) . Blend all the green chutney ingredients in a blender with a table spoon of water. Check for the seasoning and set aside. Grind all the tamarind chutney ingredients in a blender. Add required water and bring it to a boil on stove top, stir occasionally until you get the sauce consistency. Set aside to cool. Whisk the yogurt/ curd along with sugar and Khakhara seasoning/ chat masala. Add water if required to have a sauce consistency. 1. Place a Khakhara on a serving plate/platter. Apply a layer of Green chutney as a base for the ingredients to set on place. 2. Now spread a layer of grated beetroot, carrot, mango and chopped onions. 3. Generously top it with sweetened Dahi and drizzle some tamarind sauce. 4. Sprinkle thin sev and chopped coriander and serve immediately. Remember Chat masala already has salt so add accordingly if necessary. I used pizza cutter to cut my khakhara's before adding the topping for easy individual servings. Used masala khakhara as my base and the seasoning that came along with the packet is used as Dahi/yogurt sauce seasoning. Spicy tuna is always classic. Requires very less cooking and definitely easy to make. All the spicy kick comes from the Homemade spicy mayo sauce. Substituted uncooked tuna with canned tuna by preference. When it comes to sushi, presentation is key. I have laid pink sushi ginger and sprinkles of black sesame seed on this particular Spicy Tuna Sushi Roll for a dramatic effect. For step by step instruction with pictures, check my Philadelphia Crab Sushi Roll. You might want to take a look at my Tricolored California Roll. 1. Check my Sushi Rice for detailed steps and guideline to cook perfect rice to make sushi. Remember to work when its warm. 2. Insert the sushi mat in a gallon zip lock bag and place it on a flat surface with wider side closer to you. 3. We will work with just one half nori sheet for each sushi roll. 4. Take about a cup of rice and spread it on the nori sheet evenly. Now is the time to flip the sheet (optional). Assemble cucumber (2), carrots sticks (2), Tuna meat (2 tbs approximately), and drizzle spicy mayo and sparingly add wasabi across the center of the rice/ nori sheet. 5. Using the rolling mat start rolling tightly, use your fingers to tuck in the fillings to hold in place. You will have to keep rolling a few times little by little simultaneously giving it a tight hug to make it into a log. 6. Now cut the roll into 6 equal pieces in all. Make sure you don't remove or move the sushi. 7. Once its all cut, using the rolling mat I like to give them another tight hug to retain its shape. 8. For presentation, I laid thinly sliced pink sushi ginger and spread it evenly on the sushi roll. You might want to use the bamboo sheet to give it a tight hug for the ginger to set in place. Sprinkle roasted black sesame seeds. For different presentations please check my other sushi posts. If you are using raw sushi, make sure you dice them into small pieces. If you opt canned tuna (cooked), always remember to use only canned tuna in water. Do not pick the ones in oil, they might get your sushi roll mushy. Nothing can beat this refreshing six taste salad which is sure to impress your family and guests. This salad is great for summer potlucks or picnics being a no cook dish that can be increased to large quantities easily. Savor all the 6 tastes instantaneously in one meal! Ayurveda teaches that all six tastes should be eaten at every meal for us to feel satisfied and to ensure that all major food groups and nutrients are represented to stay healthy. The six tastes includes sweet (watermelon, blueberries), sour (orange), salty (salty olives), pungent (green chilly, pepper, onion, mint) and astringent (cucumber, blueberries). For more details dip into "Eat Taste Heal", An Ayurvedic Guidebook and Cookbook for Modern Living. Watermelon salad can also be perfect as a side to a grilled dish. This effortless six taste salad is naturally flavorful and attractive with its vibrant colors yet the best coolant for summer. A melon baller is a small spoon-like prepping tool used to cut round shaped sections of melons. Gently press the tool into the melon's flesh and rotate it to scoop out the melon balls. If you do not want to make balls, you may simply dice them into small chunks. 1. Using a melon baller scoop out the watermelons into your desired size or you can simple cut the melons into cube as well. 2. In a large bowl, combine olive oil, pepper and green chillies and give it a good stir. 3. To this add the fruits and veggies. Toss them gently to coat well. Sprinkle the grated cheese and mint leaves evenly. 4. Serve immediately or good to refrigerate up to 4 hours. I did not add salt to this salad as olives are always salty. Since olives contain a chemical that makes the skin bitter, salt is added to balance it out. If you opt crumbled feta cheese or go with any grated cheese you like. I had pepper jack handy to simply julienne and toss it. Crunchy appetizer made in a snap. This is a quick deep fry and would be perfect to treat yourself to feel special on any day. "Popcorn Chicken" also known as "Salt and Pepper Chicken" originated from Taiwan. It is a street food with great influence from China and Japan. They have used Tapioca flour also known as Sweet potato flour. This is a slightly different variation made with lobster chunks that is flavorful, juicy and crispy on the outside is a perfect snack or an appetizer. Lobster has a firm texture and a sweet, mild yet distinctive flavor which is accentuated in this recipe. Vegetarians try tofu (firm), its awesome! 1. In a large bowl combine all the marinade ingredients and mix it well. Add the cooked lobster chunks and gently coat them well. Set aside for 20-30 mins. 2. In a pan heat oil in medium high. Coat the lobster chunks individually with cornstarch evenly. Shake the excess off. 3. Deep fry the lobsters in small batches, giving room to fry evenly until golden brown. It may take about a couple of minutes only to flip the lobsters. Put few fresh curry leaves or basil leaves for another 2 mins. Remove and drain the oil. 4. Sprinkle some cayenne pepper or chilly powder for some spicy kick. Serve immediately with hot and sweet sauce. Fresh basil leaves is preferred over curry leaves as it adds a unique flavor and aroma to the popcorn. But since it was not readily available at home, I used curry leaves and added dried basil to the marinade for added flavor. Always remember to drain the water well before adding the marinade. You may even lie them on a paper towel to remove the excess moisture. You may substitute lobster with shrimp or chicken. If the marinade doesn't coat well, add an egg to the mixture before coating the meat in the corn starch. For vegetarians, firm tofu and paneer are good options. 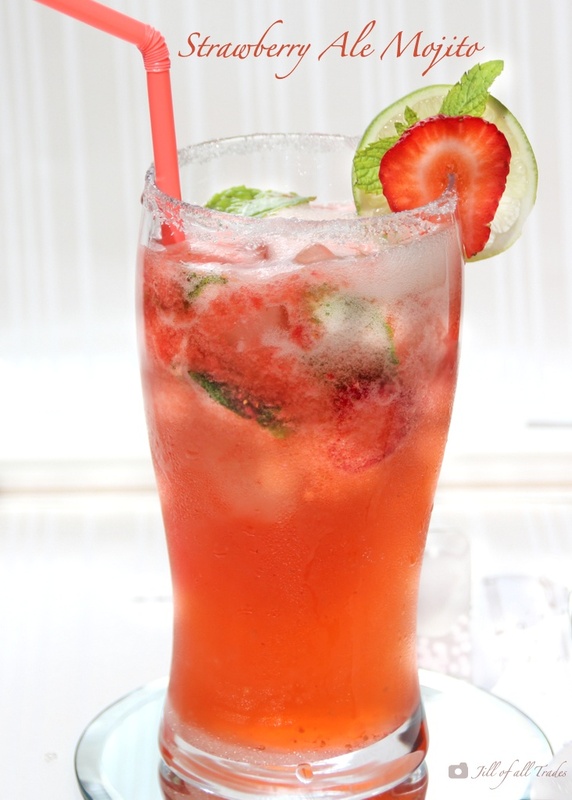 Ready to beat the heat with a glass of refreshing mocktail? 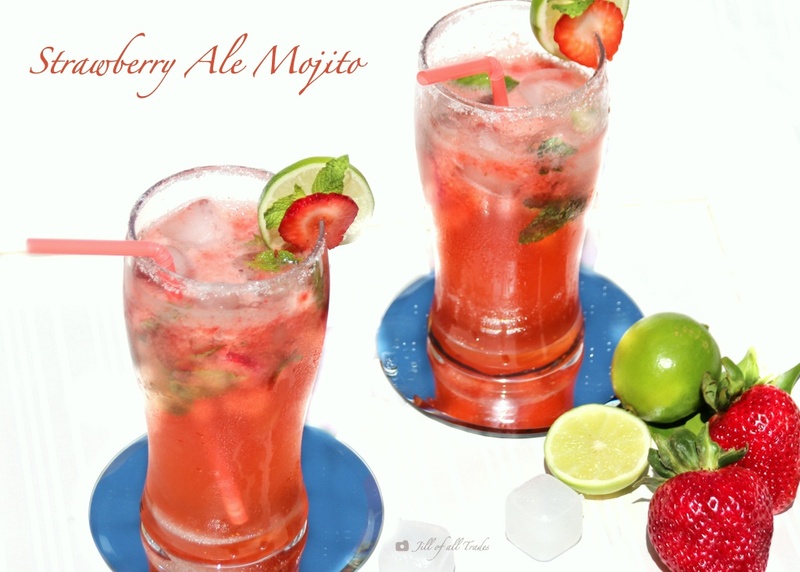 Imagine your in a paradise with this summer thirst quencher, to treat yourself with an invigorating virgin drink (non-alcohol) that is full of flavor. Yes, this mocktail is great for the whole family and good for parties too as it is incredibly easy to make. Mojito is basically an alcohol drink that contains, lime-lemon juice, mint and sugar. This virgin drink is substituted with ginger ale and a mixture of fruit juices making this an incredulous fizz. Ginger ale is a common home remedy that soothes sore throat, an upset stomach and also possible reduction in diarrhea and nausea. It is truly a treat for my kids when they are unwell to consume a cool ginger ale mocktail with some electrolyte, a secret ingredient. For beneficial effects, read the label of a ginger ale to choose an all-natural organic brand that includes ginger root in the ingredients. Enjoy this cool mocktail as the minty, lime-y tang flavors slowly seeps in with each sip, along with the little punch from the ginger ale. Cheers! 1. In a blender add strawberries (cleaned) and sugar and puree it with minimal water if required. 2. 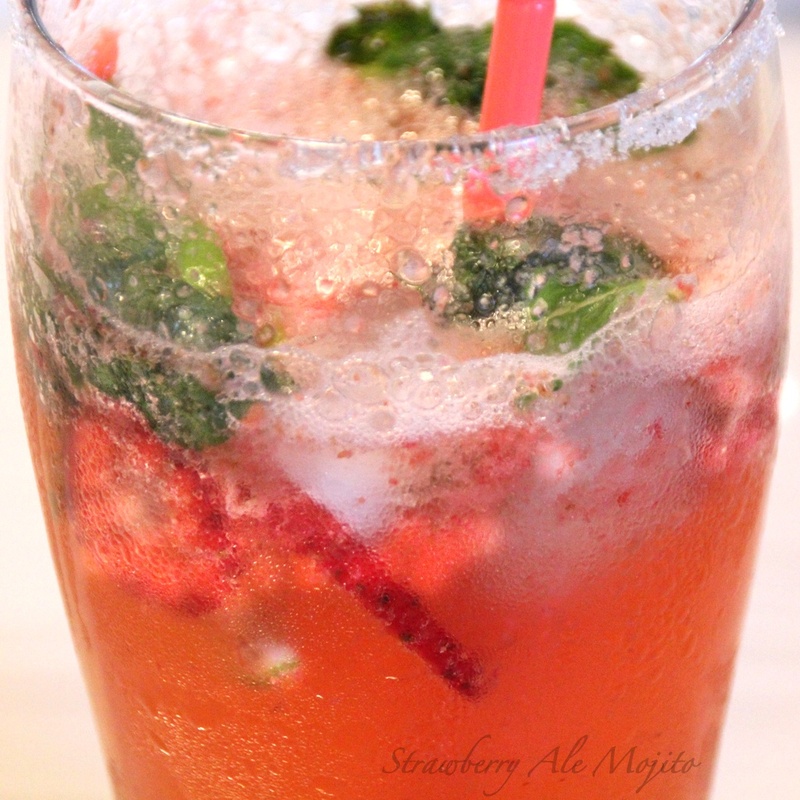 In a tall serving glass (previously prepped - check notes) add lime juice and mint leaves. Using a muddler or the back of a wooden spoon (unfinished) to gently muddle and twist the mint leaves to release its essential oils. 3. Add 3/4 glass with ice cubes or crushed ice. Now pour 2-3 tablespoons of strawberry puree. I like to add few thinly sliced strawberries to float. 4. Top it off with the chilled ginger ale or any aerated drink of your choice( check notes). 5. 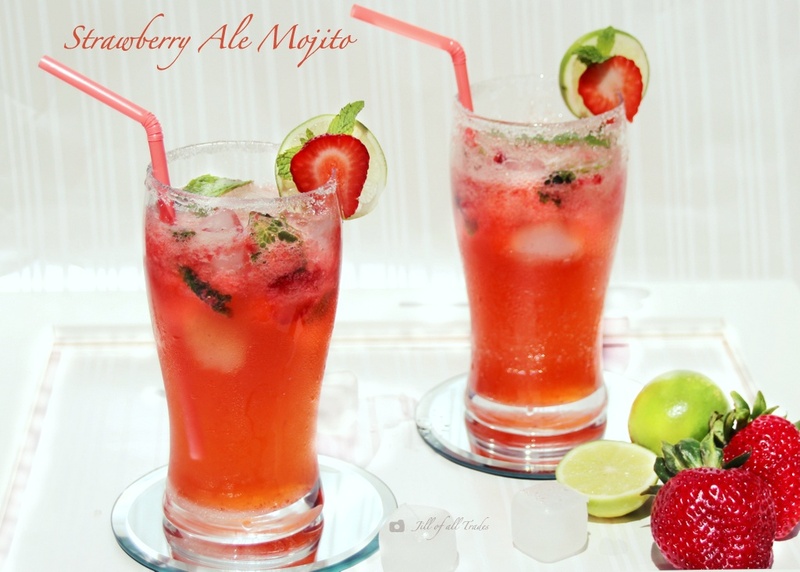 Garnish with a slice of lime, thinly sliced strawberry and sprigs of mint leaves. Serve immediately! 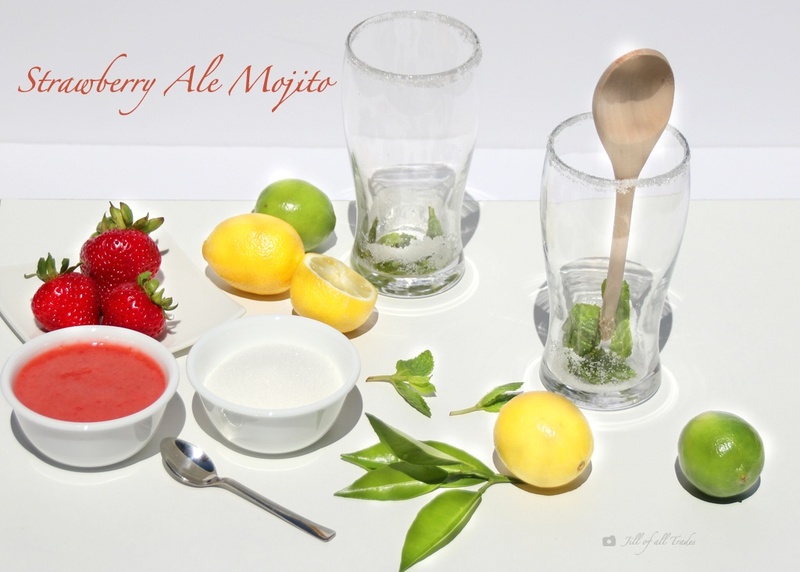 Mocktails are usually served in tall glasses to avoid crowding while adding plenty of ice. Also, choose a heavy bottomed glass to avoid breaking while muddling. Do not chop, shred or crush the mint leaves as it can release the chlorophyll that makes your drink slightly bitter. Chilled aerated drinks like flavored sparking water, club soda, lemon-lime soda (sprite) or root beer can be an alternative option for any mocktail. But remember the medicinal value from the ginger root will be missed out except for all natural root beer. For presentation, you may prep the glass rims with a slice lemon to moisten the rim and dip it in fine granulated sugar before you add your ingredients in. Crunchy, delicious and easy savory snack or topping for a salad will sure be on your favorite party add-ins or on the go healthy snack. Organic walnuts straight from farm and freshly picked rosemary from my garden tempted to make this easy-peasy, nevertheless a yummy and fragrant treat. I have been making this Caramel spiced rosemary walnut / mixed nuts for more than a decade and always been a smash hit in my parties especially Thanksgiving feasts. You may add different nuts like almonds, cashews, pecans and also peanuts to make it a mixed nuts snack. 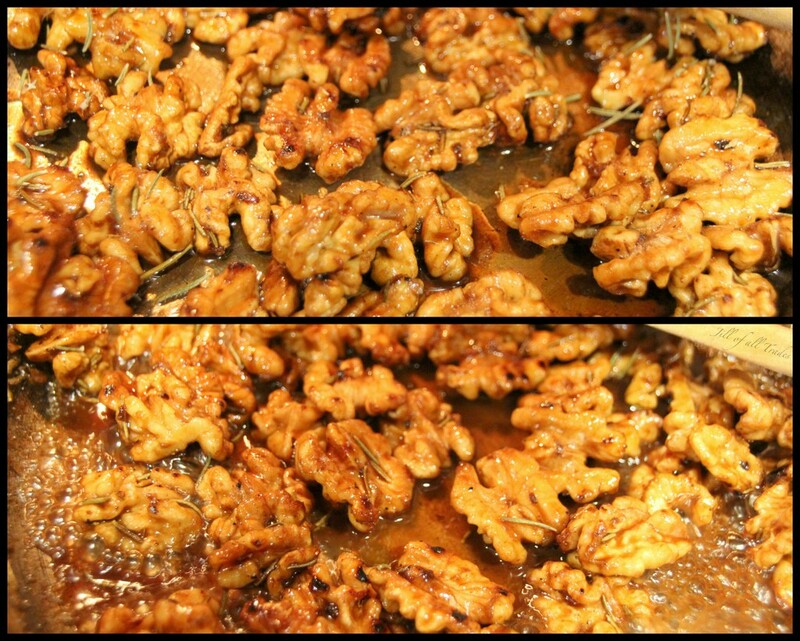 Heat a skillet/ pan in medium heat and add the walnuts to roast for approximately 5 mins or less. Stirring constantly to roast evenly and to prevent burns. Now add the rest of the ingredients and allow the brown sugar to melt and start to boil. Continue stirring until the water evaporates to get the glossy caramel consistency. Transfer the nuts to a plate/tray to spreading them using forks to cool. Once it cooled the sticky coating tends to harden yet slightly sticky and crunchy. You may toast the nuts in 300 degree pre-heated oven for 10-15 mins before tossing it into the caramel sauce. Mediterranean and Indian fusion falafel is a protein rich healthy savory snack. This snack comprises 2 different healthy versions - steamed and baked without compromising flavor. The traditional South Indian Vada with a twist is sure gonna knock your sock off. The dried garbanzo beans/ chickpeas/ konda kadalai/ kabuli chana is a nutty tasting legume. Its is an excellent source of dietary fiber, protein, copper, folate and manganese. Also helps lower LDL cholesterol (the 'bad cholesterol") levels and consequently reduce the risk of coronary heart disease. Banana Blossom is highly nutritious and rich in fiber, vitamins and minerals. It wards of infections, manages diabetics and anemia, helps nursing mothers and also boost moods and reduces anxiety. The steamed version with soft inside is slightly roasted in a kadai/pan for a thin crip outer layer for just the perfect crunch to savor this savory. The next variant is slightly easier as it is baked in the oven and then broiled for added crispiness. This version is crispier and similar to the traditional deep fried vada texture. Cleaning the blossoms can be time consuming, but its definitely worth it given the nutritious benefits it offers. Remove the outer petal to find the bunch of florets inside. Remove the stamen from each of these florets and discard it. Chop the florets and immerse them in diluted buttermilk to prevent discoloration. 1. Drain and squeeze out the diluted buttermilk from the banana blossom and transfer it to a blender/mixer jar. Add the soaked garbanzo beans and green chillies to grind it coarsely using the pulse mode. 2. Transfer to a bowl along with all the remaining ingredients. 3. Make small balls about the size of Amla /gooseberry. Arrange these falafels in oiled idly steamer plate or in any slightly greased pan. Make sure the steamer container contains enough water making sure the water level is slightly lower than the arranged falafel plates. Steam for 10-12 minutes. When done, remove the steamed falafels and in small batches roast them in a kadai with 3 teaspoons of oil. Use a wooden spatula to gently turn them to roast evenly all around. This final step might take 3-5 minutes for each batch which accentuates the flavor of these healthy banana blossom falafels. This version was a huge hit, the kids relished it as much as adults did. Pre-heat the oven to 350 degree Fahrenheit or 175 degree celsius. Flatten the balls to a disc shape like vada's and arrange on the greased baking sheet and bake for 30 minutes, turning once half way. Once done, switch the oven to the broiler mode. Spray the cooking oil on the flattened falafels and broil for 3-5 mins or until it turns crip. Flip and repeat the same on the other side as well. 1. Drain and squeeze out all the buttermilk water from the banana blossom before grinding it, else the balls will be too soggy. 2. If your balls or the disc shape doesn't form easily, you may add 1 tablespoon of channa dal flour / pottukadalai mavu to the mixture, as it will absorb the excess moisture if any. 3. The banana blossom are usually steamed before mixing with other ingredients, but I eliminated this step and it tasted scrumptious. Sushi Rice is the basis of Sushi. Japanese short or medium grained rice such as Homai or California Calrose is starchy and helps hold the roll together very well. Rice should be shiny and not mushy, with a slightly tart and sweet taste. Here is the perfect way to make sushi rice, the base for any kind of sushi roll. 1. Wash/rinse the rice until the water runs clear. 2. In a separate bowl make the "Sushi Su"- a vinegar solution that seasons the rice. Mix vinegar, sugar and salt in a bowl and let it sit to dissolve. You may heat it up in low to dissolve completely. Stir occasionally. 3. You may use a stove top or rice cooker method of cooking the rice. I have tried both, felt the rice cooker maintains the right consistency of the rice. If using stove top, keep the heat on high, when it comes to a boil, lower the flame and cover using a lid and allow it to cook for about 6-8 mins. 4. After its cooked, transfer the rice to a wooden bowl using a wooden spatula, as the metal can ruin the texture of the rice. 5. Now is the time to add the Sushi Su to the rice and mix gently. Let sit for 10 mins covered with a damp cloth to prevent from drying, until ready to use. Make sure the rice is well rinsed before cooking, as the excessive starch content can make the rice mushy. Always work with warm rice for best results. Use only cold water to uncooked rice and then turn on the heat for best results. Never refrigerate your cooked sushi rice as it can dry out easily. 1 cup of uncooked rice makes 3 rolls. Sushi is mainly served with Wasabi or Japanese horseradish. This condiment has an extremely strong pungency more akin to hot mustard than the capsaicin in chilly pepper, producing vapors that stimulates the nasal passages more than the tongue. First timers do watch out, it has to be consumed very sparingly mixed with soy sauce, as a dipping sauce for the sushi. I have tried Green Sushi Rice and Black Sushi Rice. When rinsed a small portion of uncooked rice, I noticed the color was getting washed off as well. Hence cooked the rest without rinsing, the green sushi rice turned out mushy whereas, the black rice didn't cook well, took longer time (like brown rice). The best alternative I would suggest is to add food color to the rinsed white sushi rice while cooking. Divide the well rinsed uncooked sushi rice and cook them separately adding a tiny amount of food color that you desire. Check out my Tricolored California Sushi Roll and Philadelphia Crab Sushi Roll. There is a series of Sushi's coming up. Stay tuned! European Tiramisu Cake is an Italian and Russian medley made from scratch. Although Tiramisu is originated from Italy, I have replace the lady fingers with homemade Biskvit cake a very popular Russian sponge cake. This easy Biskvit sponge cake is fast, delicious and most importantly you can't go wrong. It is an egg based cake which is spongy enough to absorb the coffee syrup to retain the moistness of the cake. It requires very less flour and sugar. The freshly whipped expresso flavored frosting is truly a heaven. Cottage cheese is an explicitly wonderful substitute for cream cheese or mascarpone cheese. I made this delicate Tiramisu cake for my better half to surprise him for his birthday. My kids urged for coffee flavored cake only. Decided to go with Tiramisu being our family's all time favorite nevertheless picking the right ingredient was challenging to keep the calories and sugar low without compromising the flavor. Being my first try whipping a real whipped cream icing, I had to do a lot of home work to get the right tips to keep my icing fluffy and airy with the right consistency. I am excited to share that the end result was outstanding. 2. Beat the cottage cheese, sugar and instant expresso granules to a creamy and smooth consistency (blender works better and faster). Transfer to a mixing bowl. 3. Using a silicon/ rubber spatular gently fold in the whipped cream into the cottage cheese mixture to incorporate well. Refrigerate until ready to frost the cake. 1. Mix in the instant expresso granules in the boiling water with sugar and stir until sugar dissolves. 4. I melted some semi-sweet chocolate in the microwave and pipped it on a parchment paper for some random designs. Using the smallest round tip, drew some vines and some quick leaf shapes for the sides of the cake. Refrigerated for 15 mins to set. Then, I spread remaining chocolate on the sheet and placed another parchment paper over it with a flat board (as a weight) for it to avoid curling. Used this as an edible plate for serving with a piece of cake. For directions to melt chocolate, check my Chocolate Cream Cheese Truffle. 1. Heavy whipping cream is highly recommended for real whipped cream frosting. Keep it cold until the very last minute to whip it up. Also refrigerate your mixing bowl and whisk for about 15 minutes prior to whipping the cream to get the best fluffy results. Once you see stiff peaks on the tip of your whisk, immediately stop and refrigerate coving with plastic / cling wrap. Over-beating can cause the cream to turn buttery. Homemade Bean Burgers are good source of protein, iron and fiber for a daily healthy vegetarian diet. This particular burger patty is primarily made with Black gram/ Urad dal, a healthy pulse with various nutrition facts. A perfect weight watcher's recipe to reach your goal happily with low calories. Eat right and stay fit to be healthy! Black Urad dal also known as Black lentil/ Black gram/ Vigna mungo/ Urad saboot/ Ulundu parruppu or Minumulu. It is a highly nutritious special kind of bean that originated from India, Southern part of Asia. This healthy pulse is extensively utilized in various culinary preparations such as Idly/dosa batter, vada and papad. 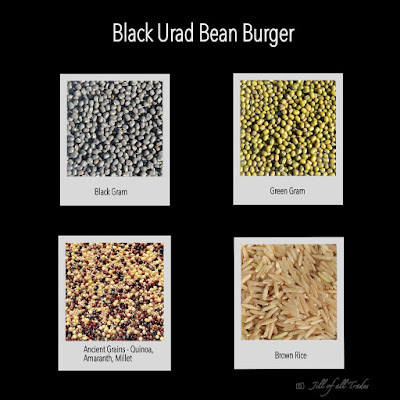 Urad /Black gram is a probiotic food that helps digestion and its high protein for maintenance, growth and repair of every tissue, organ and cell. 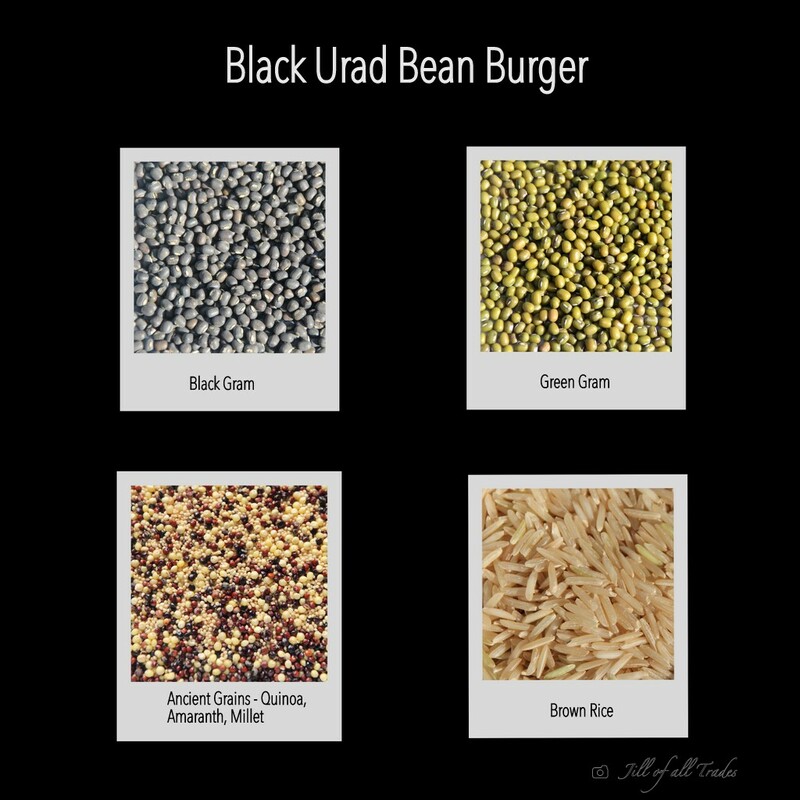 For more health benefits of Urad/Black gram check out Amrisha's article from Blodsky. I proudly declare that the source of this recipe is from my beloved husband. He consistently analysis the nutrition facts before purchasing or relishing any food to stay fit and healthy. He came up with the ingredients, quantity and the nutritious facts hidden. My job was simple to add basic seasoning and cook to perfection. Working woman can make ahead and freeze for any busy weekday quick fix meal. This Burger recipe is family-friendly as kids also savor this healthy burger. You can skip the bun to wrap the burger and veggies in your favorite flat bread like tortilla, pita bread, naan or roti. My tween stated this burger is second to none as it tastes either like minced chicken or goat patty. Trust me meat-eaters, you wouldn't miss meat at all. Let's go green! 1. Peel the potatoes and them cut them into quarters. 2. Wash and soak the black gram, green gram , brown rice and ancient grains for minimum 6 hours or over night. 3. In a rice cooker add 3 cups of water and add the soaked pulses and grains. In the vegetable steaming tray arrange the potatoes evenly and cook them according to your rice cooker settings. You may use pressure cooker method as an alternative for 1-2 whistles. Check notes for other variations of steaming potatoes. 4. Once cooked and cooled, add the required salt and ground pepper. Using potato masher, mash the potatoes and mix them well with the pulses and grains. 5. Divide into 10 balls (orange sized) and shape the mixture into 4 inch wide patties. Toss in the bread crumbs to coat evenly. 6. In oiled grill or on oiled skillet/pan place the burgers in medium heat about 5-6 mins on each side or until golden brown. 7. Toast the buns lightly in the same skillet/pan or grill. 8. Add lettuce, tomato, burger patty, onion rings, cheese and ketchup if desired. Serve with fries and drink to enjoy as a meal especially for fast food loving kids. 1. Microwave steaming is another method to steam the potatoes. If choosing stove top method, in a large container add 2 cups of water and bring to a boil. Arrange the potatoes in any stainless steel vessel or steaming tray that fits inside the large container. You may use idly stand for the same purpose. Steam for 10-12 mins. 2. The organic ancient grains is available at Costco. You can also purchase the grains individually in small portions and combine them together according to availability. 3. Do not boil the potatoes in water as it may absorb moisture and the patties can get soggy. 4. 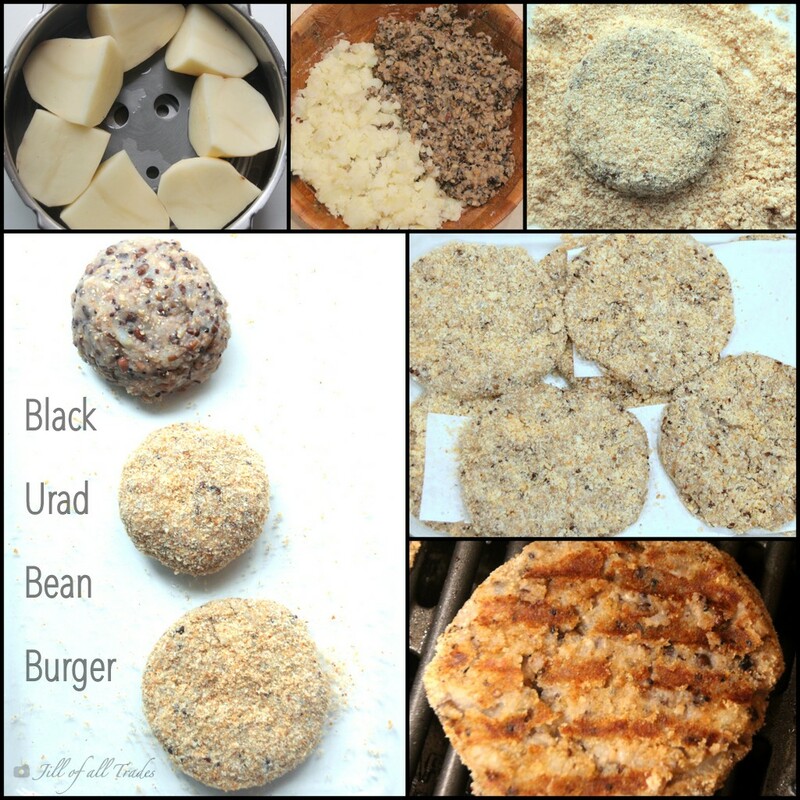 You can freeze the uncooked patties for future use. I prefer placing a piece of parchment paper between the patties before arranging them in a freezer ziplock bag to remove the patties individually. 5. Freezing the patties lined up individually in a large covered tray for minimum of 2 hours, before stacking them in ziplock bag is the perfect and best method to remove frozen individual patties for cooking. Enjoy making and feasting on these delicious and nutritious Black bean burgers! Married a protein-packed Cottage cheese with fresh Blueberries harmoniously for this Valentines Day special! A deliciously creamy blueberry cheesecake just melts in your mouth. This protein rich and low-sugar version is a last minute healthier dessert plan to delight my Valentine's palate. The fresh and sweet blueberries adds natural sweetness and gorgeous color to the cheesecake. BelVita is not just for breakfast anymore. Replaced the Graham crackers crust with this nutritious cinnamon brown sugar flavored BelVita crust. It is an effortless dessert, nevertheless requires baking. Trust me you and your guests will crave for seconds! Yum! 2. 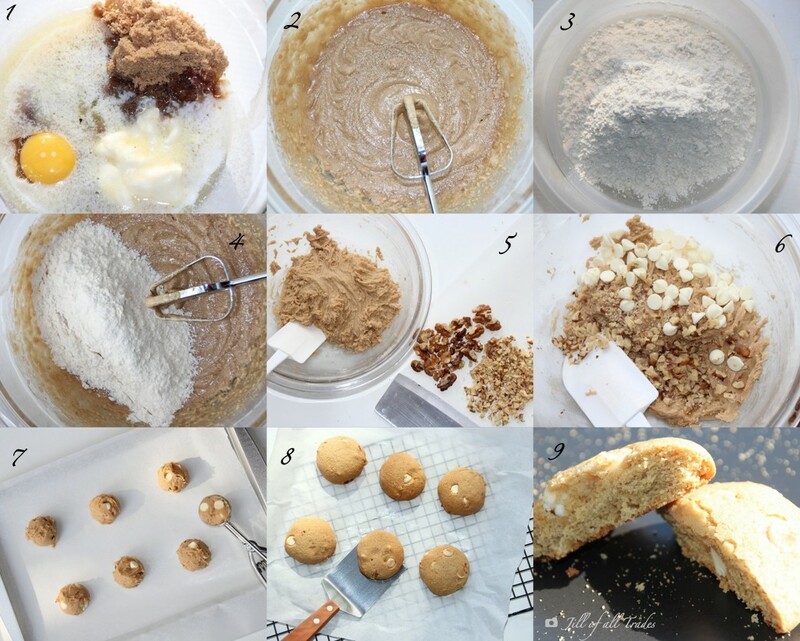 Crust: Crumble the biscuits in a blender until fine crumbs. Coat the pie pan with cooking spray on the bottom and sides to remove the pie easily after baking. Mix the crumbs with the melted butter and add a teaspoon of water if necessary. To check for the right consistency, you should be able to make a rough ball when compressed. Now spread the crust mixture evenly flattening on the bottom and up the sides of the pie pan. Press firmly and set aside. 3. Topping: Add all the topping ingredients in a sauce pan and bring it to a boil and simmer for few extra minutes to get the right consistency. Once done turn the heat off and set aside. As it cools the topping gets thicker like a syrup consistency. 4. 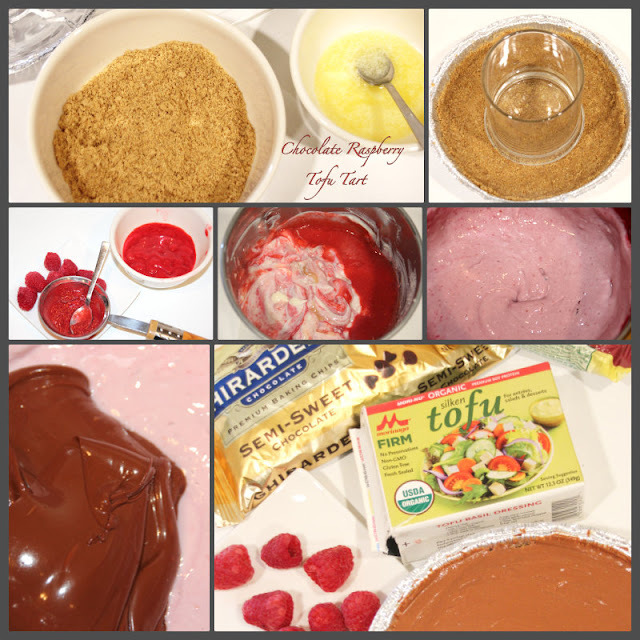 Filling: Add all the filling ingredients in a large bowl and blend it to a smooth mixture using an electric blender. 5. Now, pour the filling in the prepared crust pan and bake for 45 mins or until the center is firm. 6. Once done, let it cool for 15-20 mins. Since I used a disposable pie pan, I ran a clean knife along the edges to separate the cheesecake from the pie pan. Made a small cut on the edge to peel the pan off to retain the shape. 7. Serve with warm topping and cool whipped cream (optional). 1. The right way to clean fresh blueberries (any berries, fruits and vegetables) is to soak in warm water with a tablespoon of vinegar for 10 minutes for all the wax and dirt to eliminate. You will notice your berries sparkle with its natural bright color. 2. If you want to store the berries for future use, always do the above with room temperate water. Pat dry and line the storage container with paper towel slightly keeping the lid open. Don't forget to refrigerate! 3. The natural sugar from the blueberries is being accentuated in this cheesecake recipe. The sugar level in the filling is relatively mild on purpose. But when the topping is added, it will be even-steven. You don't want to miss this! A perfect quickie that is highly nutritious, low in carbs, and flavorful is versatile and mouthwatering. Zucchini Pasta/Spaghetti is also known as Zoodle or Zucchini Noodle. This extremely healthy fusion recipe is full of Italian flavored stir-fry prepared in minutes. Anyone on diet would not want to miss this restaurant style dish that you don't find in a restaurant. Vegetarians can skip the seafood, and make it a "Go Green" dish with no compromise with the flavor to enjoy it throughly. You may want to check out my Bruschetta with Sun-dried Tomato Pesto. My husband relishes this low-carb dish profoundly. Eat healthy, stay fit and have fun! You will require a Spiralizer or a Mandoline to make the veggie Pasta/Noodle. To learn more and get inspired about spiralizing Click here. For the directions to use a Hand-Held Sprilizer Click here. 1. For the Sun-dried Tomato Pesto add all the pesto ingredients in a blender and simply whip up this zestful sauce. 2. Grab a spiralizer and zucchini and do the twists for fine pasta/noodle, or you may use your mandoline and slice thin and long strips like noodles. 3. Heat a wok / large pan with 1 tablespoon of olive oil and add the freshly made sun-dried tomato pesto, salt and chilly flakes. Allow it to cook for few minutes until it comes to a boil. 4. Now is the time to add the shrimp, zucchini pasta and bell pepper. Saute for 2-3 mins until it starts to wilt. 5. Turn the heat off and toss in the black and green olives. 6. Garnish with green onions and serve hot! 1. Always choose fresh zucchini to spiralize. You may peel or discard the outer skin. If using mandoline avoid the seeded part of the veggie. 2. Spiralize your veggie right after the prep work is done. In this case the sauce comes first in the directions. 3. Never cook your pasta/noodle more than 3-4 mins. Over cooking can cause the veggie to wilt and you will end up with a soggy dish. 4. Allowing the prepared meal to sit can get soggy as well. Serve the dish immediately to retain the texture of the pasta/noodle. Enjoy staying fit! A heavenly relish delish for all coffee lovers! Have a weak spot for some sweet indulgence? Lift this edible dessert bowl and not let go to throughly enjoy your luscious dessert - Eggless Tiramisu Mousse. One of the most popular Italian dessert Tiramisu, quite literally means, "pick me up", "cheer me up", or "lift me up". A blend of the two bold caffeinated flavors of expresso and cocoa, yet still fairly light dessert is irresistible and unforgettable, as it certainly fulfills the criteria for a pleasurable dining experience. This elegant and rich decadent dessert is layers of delicate flavors that would melt in your mouth. A no-bake, no-cake, eggless mousse can be prepared momentarily and chilled until ready to serve. You cannot go wrong with this simple recipe, that sure would be a huge hit at your family dining table. I served my Eggless Tiramisu Mousse in the Chocolate Tulip Bowl that I made ahead. For the Chocolate Tulip Bowl recipe click here! Dig in! 1. Mix the instant expresso in hot water and stir allowing it to cool. 2. Whip cold heavy whipping cream until stiff peaks form. Once done, refrigerate until ready to use. 3. Using a hand blender mix the marscarpone cheese and confectioners sugar until smooth and creamy. 4. Add the vanilla extract, expresso to the above and mix well. 5. Gently fold the whipped cream into the expresso mixture. Avoid mixing too much to retain the fluffy texture. 6. You may use a piping bag with a large round or 1M tip to fill in a glass bowl, or simply scoop a small amount using a spoon into the bowl you want to serve in. 7. Top the layer with a thin layer of cocoa powder and whipped cream alternatively. You may use as many layers you want. 8. The top layer can be decorated with chocolate shavings or dust cocoa powder very sparingly as it can be bitter if used too much. 9. Refrigerate to chill the Tiramisu Mousse until ready to serve. Enjoy! You may reserve 1 teaspoon of expresso for decorating the top layer with swirls. Whipping heavy cream step can be eliminated to substitute with store bought whipped cream for an easy to make dessert. Excited about another Chocolate recipe!!! Create a beautiful decorative bowl that is edible and elegant for any special occasion. This simple and effortless recipe is so much fun to make and impress your guests. This is my second attempt to make these edible chocolate bowls. Chose to create different shapes - a textured tulip shape and smooth dome shape. These chocolate bowls can hold different treats and yummy desserts like chocolate candies, pretzel sticks, candied popcorns, custard, pudding, ice cream, mousse, whipped cream with fruits and the options are endless... I also created a budding tulip for a milk-shake this time. All you need is one main ingredient which is chocolate of any kind with good quality. Working with semi-sweet or dark chocolate is easier than white chocolate. Balloons are used as an inexpensive mould. They must be pre-washed with soapy water and dried throughly, as even a tiny drop of water can ruin the texture of your melted chocolate. I used 6-8 water balloons (inflated with air - 6 inches) and it seem to be just the right size to work with. Also note some are allergic to latex, if so opt for a mould that's available in any craft store. The best part is that the melted chocolate can be reused. So no worries of wasting the left over chocolate. Now is the time to WOW your guests or your spouse for this Valentines day with your glorious and beautiful tulip bowl filled with your favorite and delicious dessert. 1. Inflate your clean balloons with air and set them upright on a cup, or line a tray with parchment paper for the chocolate dipped balloons to set and cool. 2. 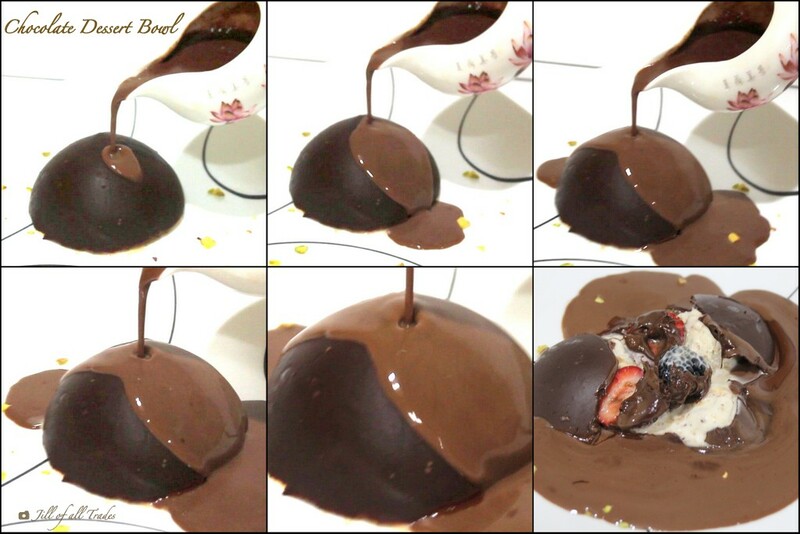 Melt chocolate in a clean microwave safe bowl that can easy fit in your inflated balloons. For directions to melt your chocolate check my Cream Cheese Truffle recipe. 3. Let the chocolate cool for about 3-5 mins. Use your clean finger tip to check for a runny but warm temperature. If its too hot, the heat can burst your balloon creating a messy kitchen. 4. For marbleized effect - Use both white and dark /semi-sweet chocolate. In a bowl of melted semi-sweet chocolate add a small amount of melted white chocolate and make very light swirls using knife and then dip your balloons in it. Do this in a small quantity, because if both the flavored chocolates are mixed, the excess cannot be reused. 5. Simple flower shaped bowl- Dip the balloon same as above but in an angle on all side about 5-6 times creating petal shapes. But this bowl has to be placed on a lined parchment paper for the base to set well to prevent from rolling. I tried the same flower shape and also covering almost one half of the balloon fully (6 inches) to give a unique shape. 6. Tulip shaped bowl- I used my rubber spatular and applied from top to bottom (about 4 inches), to have the textured petal effect. Once all the sides are covered with chocolate, rest it on the parchment paper. 7. Tulip bud shape - Do the same as the tulip bowl but all the way to the knotted area leaving about 1.5 inch diameter opening. It is quite tricky to remove the balloon after deflating, so patiently and gently peel off the balloon from the bottom. 8. Dome shape- Holding the knotted end, dip the bottom of inflated balloons in the melted chocolate about 3 inches or more as per your desired size and lift it gently to shake off the excess. Quickly turn it upright and place it on the cup to set. 9. To set these bowls, place them all in the fridge for 15-20 mins. 10. Remove from the fridge and now is the fun part of deflating the balloons. You may use a pair of scissors to cut the knotted area, for the balloon to slowly deflate. I prefer to use a needle to poke the balloons for the tulip shape for the edges to slightly curve. 11. Very gently pull off the balloons from the bottom. It is very tricky to remove from the bud shaped bowl, I used scissors and held the knot on another hand, once the air is released, gently pull the balloon off. If its difficult, use a long needle to pull out the balloon. 12. Always keep the chocolate bowls cool (refrigerated) until you are ready to serve them with your desired filling. Placed 3 small scoops of dulce de leche ice-cream in a shallow plate with berries and chopped nuts. I covered completely with the chocolate bowl dome. Quickly pour in a hot chocolate (expresso flavored) ganache in the center for the dome to open up on the top and break down eventually. To view a video, click here! Using the remaining chocolate that we dipped in, I added 1 cup of cream, 1 teaspoon of instant expresso, 3 teaspoon of powdered sugar. Mix all the ingredients together and bring it to a boil for the hot expresso chocolate ganache to melt your chocolate dome. Chocolate chips are easier way to melt evenly in a microwave or double broiler. If you want your chocolate bowl to be thick to hold your desert for longer period of time, I would repeat the dipping process after the 1st layer is set. You may spray cooking oil on to the balloons before dipping in the chocolate to remove easily. although I didn't have to use it. Cold desserts like ice cream works very well. Make this Valentines day special with these delicious and glorious dessert with your favorite filling... Any guesses on my next post? gift for any day of the year. easy and irresistible. Be happy eat Chocolate! microwave method to melt the Chocolate for this recipe. 2. Add the softened cream cheese and mix well. 3. Once its incorporated throughly, add vanilla extract and confectioners' sugar and mix again. 4. Using a melon baller or small ice cream scooper or a teaspoon take small amount of this mixture and roll it with clean hands gently and place it on a cookie sheet lined with parchment paper. 5. Now is the time to roll the truffles in different toppings, like cocoa powder, desiccated coconut, or even toasted chopped nuts. 6. Refrigerate for about an hour. 7. 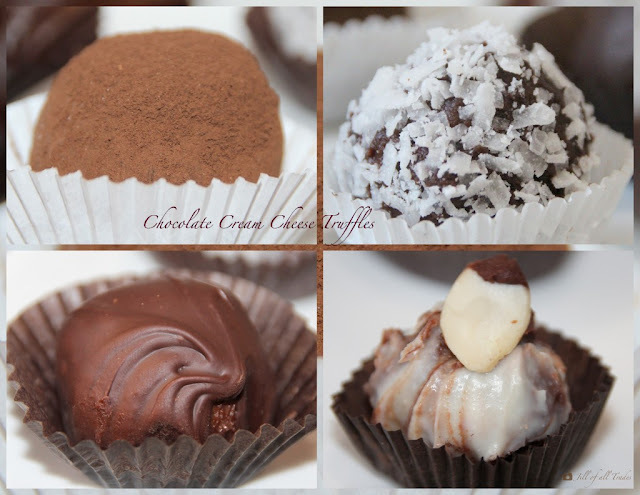 For a chocolate covered truffle, melt chocolate as directed using any of your favorite method. Gently dip each truffle one at a time in the melted chocolate using a clean dry fork and lift using the same to tap it twice on the side of the bowl to remove excess chocolate. Immediately place it carefully on the lined cookie sheet and refrigerate to set. 8. After an hour serve to indulge or store in closed container refrigerated for 1-2 weeks. from heat draining the oil and keep it aside. ginger, garlic, soaked almonds and cashews to a fine paste. this to cook for 10-15 mins until the raw aroma disappears. beetroot piece and grind it to paste. allow it to cook until the oil begins to leave. almond milk and stir gently. substitute root vegetables with red bell peppers. tomato and red pepper puree. 3. Simply use almond milk in place of fresh cream. natural sweetness from the red peppers will suffice. A common bread made mainly in North India though its originated from Middle east. Naan or Indian flatbread is traditionally baked over clay tandoor oven with wood burning fire. This home cooked Naan or oval shaped flatbread is on stove top with a lid to cover for soft and fluffy texture. You must have read or even tried different kinds of recipes to make them. But I have a very easy recipe with fewer ingredients that's also quick to make and most importantly this naan dough doesn't need long resting time if using self raising flour (check notes for this tip). Most importantly this recipe has no yeast added. These soft textured and oval shaped flatbread/ Naan with its golden bottom crust would definitely be your family's favorite too. I remember making this recipe since I was in College. My kids love them when paired with the Panner Butter Masala or Chicken tikka masala. and soft dough for about 6-8 mins. slightly smaller than a tennis ball size. immediately with a lid with a small vent. bubbles now is the time flip it 1 more time. seconds on the flame directly. flip to do the same on both sides. sprinkle with cilantro leaves and serve hot. 1. If using self raising flour, as mention earlier the dough doesn't need long resting time. Also it requires only 5 major ingredients as we can avoid adding salt and baking powder and baking soda. I have tried with just 10 mins of resting time and it turned out with exactly the same texture. 2. I use rice cooker lid to cover as it works well being glass its easy to see the bread raising and the small hole acts as a vent for the moisture to evaporate. If using without a hole, allow a slight opening for the same purpose. 3. Serve hot, else stack them in a casserole lined with a paper towel to absorb moisture and cover with lid as and when you finish cooking, by doing so it still stays warm and soft. preventing and treating cold and cough. 1. In a blender pulse all the dry ingredients to a fine powder. well with the ladle and heat it on the stove until it comes to a boil. 4. Now add the Masala powders and give it a stir. 6. Serve hot as a soup or with rice. Enjoy! 1. If you are lucky to get fresh Tulsi leaves, simply grind it along with the wet ingredients. 2. You may substitute Churna powder with any instant Sukku coffee powder as an alternative. 3. Lemon or Gooseberry/Amla based Rasam also works well with this recipe. For Amla Rasam recipe CLICK HERE from Tumas Tongue Treates. Ajwain/Carom, Cloves and Amla also help treat cold. You may add 1/4 teaspoons of each along with the dry ingredients if you wish. 4. Raw Buckwheat Honey is available at Amazon. children under the age of 1 should not intake honey. All the above ingredients are of same ratio. They should be dried under sun separately for 2-3 days or in low-medium heat dry fry them on stove top in a wide pan until the aroma is being release. Some ingredients might require longer time to dry out completely. Once the Coriander seeds are dried completely, powder it first in a blender or coffee maker . To this add the lemon juice and mix well and allow it to dry under sun once again. Then break the lumps apart and mix with the other ingredients that are dried and powdered similarly. Store it in an airtight container for about 6 months. The following are 3 different direction to intake orally. intake orally. Do not drink water for the next 10-15 mins. boil and drink it warm. For Children, add a teaspoon of honey. Rasam / Soup. To try Churna Rasam recipe Click here! 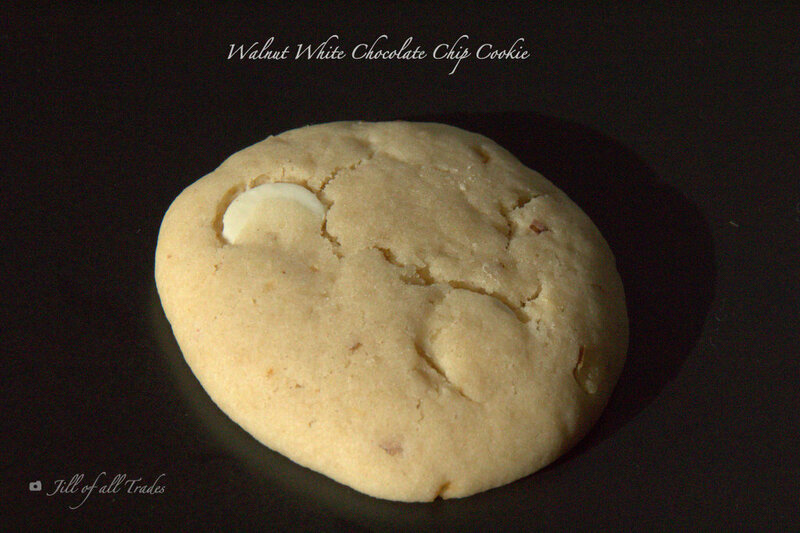 Cookies were not my favorite until I tried this recipe. 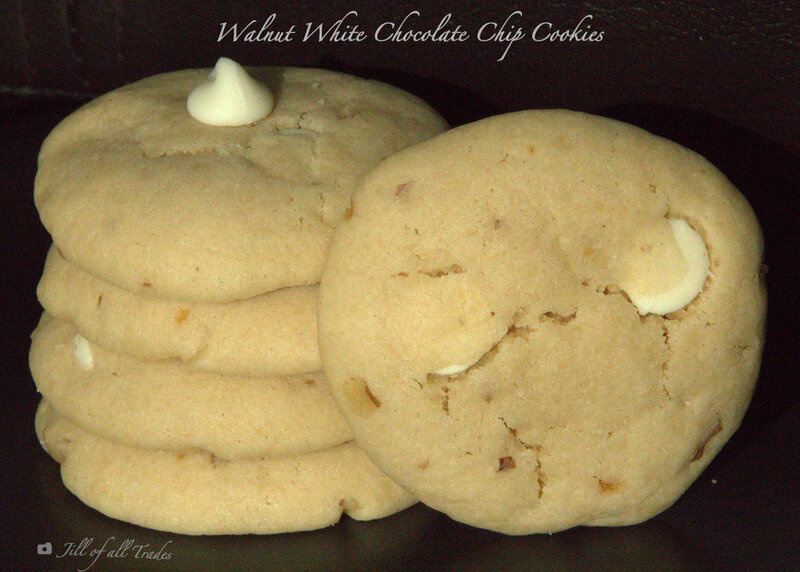 Walnuts and white chocolate go hand in hand. 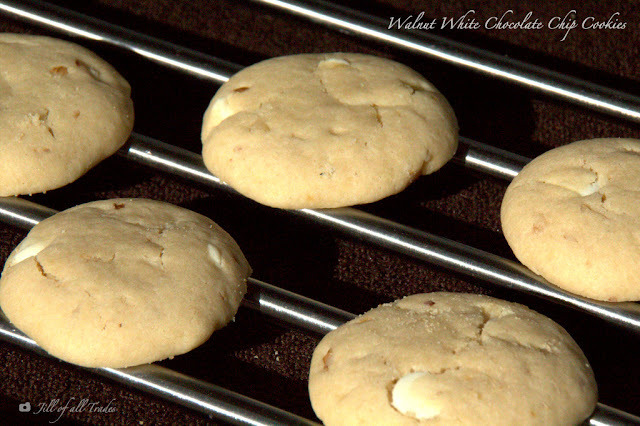 These fluffy and soft cookies have just the right amount of crispness to enjoy it thoroughly. This is a versatile recipe, you can always go with any kind of nuts(Pecans or almonds) or chocolates (Milk, dark or semisweet) you like. Perfect to do with kids as well...Enjoy baking and relishing these yummy cookies! Fish balls are a delicious and crispy party snack or an appetizer. Fish/seafood is rich with omega-3 fatty acid and good source of protein and iron. The best part being low in saturated fat. Though this looks like a deep fried recipe, I have shallow fried them for a healthier version. You may also shape it into patties and shallow fry like fish cutlets. 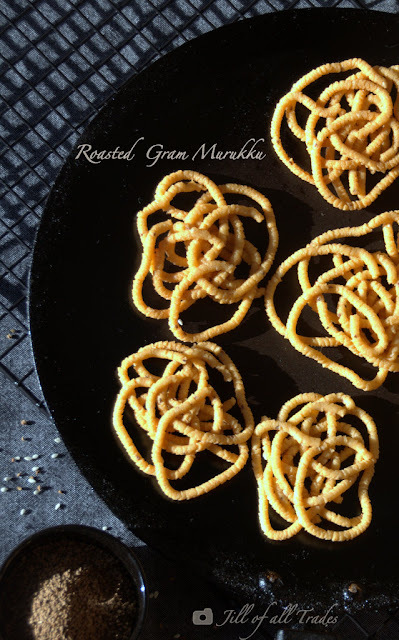 Roasted Gram Murukku / Pottukadalai Muruk is a savory, crunchy snack originated in India. Yet another authentic recipe from Mom. I should admit this is an elaborate process, but definitely worth it. Trust me, after having relished this recipe, till date none can take its place. You will throughly enjoy the lightness and just the right amount of crisp texture loaded with unique flavors. The secret is nothing but to grind the soaked rice as the base (instead of a store bought rice flour) to make this Roasted Gram Murukku. Enjoy making and savor this savory! Soak Idly rice for at least 3 hours and grind it to the idly batter consistency. You may add water as required. Powder the split roasted gram in a mixer and sieve it. Set a large Kadai and heat with the required oil for deep fry. In a large bowl mix the rice batter, roasted gram powder and all of the above ingredients. You may apply oil to your hand and mix to a soft smooth dough like a Chapathi/Roti dough consistency. Take a fist size of dough and fill in the Murukku press (using a 3 or 5 eyed plate). On a clean thin cloth, or on the greased back of spatular; press the dough in one complete circular motion from center to outside. Gently set it with your finger and transfer it to the hot oil kadai carefully. You will notice the sizzling sound from oil reducing gradually as its being deep fried. When you the sizzling sound dies, you will see a golden brown/beige colored Murukku, its time to flip it gently to cook/fry the other side. Again, when the sizzling sound reduces, check for the right color and remove from heat while draining the oil . To check if the oil is heated enough, press a spatular in the oil kadai to see bubbles raising. Or drop a small piece of dough into the hot oil and check if it rises immediately for the right temperature. Set the stove in medium - high flame for even cooking. I prefer using a clean white thin cloth to press the dough into the required size and pattern when a set of murukku's are frying. This allows the dough to set on the cloth for few minutes absorbing any excess water. Also prevents the snack from getting too oily. I fried 5 murukku's at a time. Make sure you keep the remaining dough always covered to avoid drying out. If the dough is kept for long hours more then 4-5 hours it can ferment easily and spoil the taste. So its recommended that you fry them immediately. The dough can be refrigerated in an air tight container for few hours. Once the cooked murruku is removed transfer it to a tray lined with paper towel or napkins to absorb any oil. Let cool for about an hour and store it in an air tight container lined with paper towel or napkins. 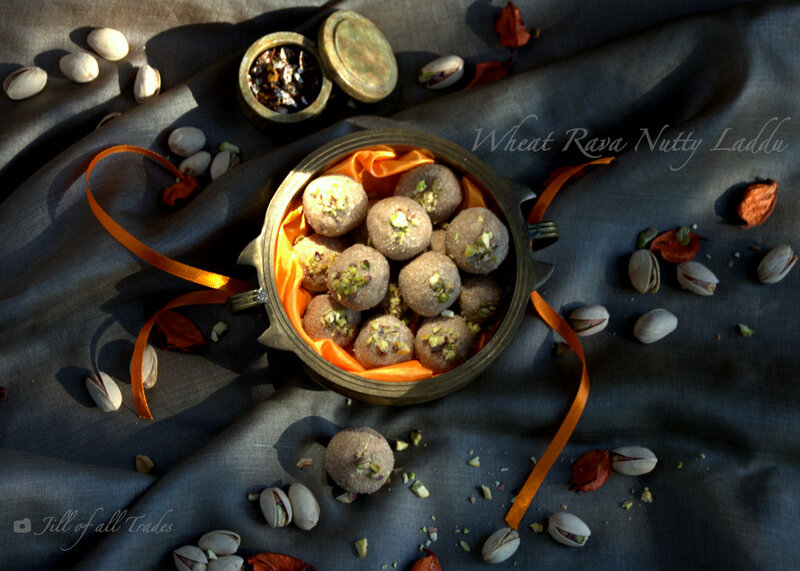 Peda, a milk fudge is very popular North Indian sweet that is traditionally made with Khoya or mawa. 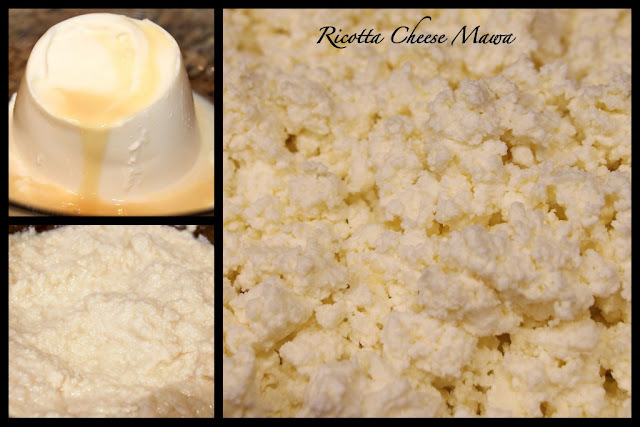 Ricotta cheese is an excellent substitute as its much quicker than evaporated milk method of cooking. This recipe can easily be adjusted to your taste with regards to the sugar level. Although this recipe can be made with microwave, I chose to use the regular stove top cooking as i'm not a big fan of microwave. This colorful Peda is irresistible both to the eyes and tastebuds. Do give it a try to enjoy as much as we do. Heat a non-stick pan and add 1 tablespoon of ghee and the ricotta cheese stirring continuously in medium-low flame. The cheese will start to melt and turn soupy initially, but keep stirring for close to 10-15 minutes for all the water from the cheese to evaporate. When the water evaporates, it starts to thicken leaving the sides of the pan to form a ball of khoya as you keep stirring. Now add the sugar and milk powder to this khoya and mix just to incorporate well. Turn off the stove and you may divide it into 3 parts if you desire all the 3 varieties or chose as you wish. Set the two portions aside, leaving 1 in the pan itself. For a Saffron Peda, heat the milk and add saffron to soak in for 5 mins to release its flavor and color. Add the food color to the same and mix in 1 portion of khoya in the pan. Turn the flame to medium and stir continuously until it thickens for close to 5 to 10 minutes. Now its ready to shape into small lemon sized balls or disks and decorate with a saffron stigma. For Pista Peda, grind approximately 20 pistachios with milk to a smooth paste and add to 1 portion of Khoya with green food color and essence. In a heated pan stir until this mixture thickens. Its ready to be shaped and decorated with pistachios. Now for the last being Chocolate Peda, you don't have to get to the stove. Just add the cocoa powder and the chocolate syrup and knead it to a ball. Its time to shape and decorate with chocolate. Viola! All the 3 different flavors are done. Hope you enjoy making and enjoying this tricolored milk sweet. If you chose to use microwave method, you might have to keep stirring every 3 mins to avoid any burns, until you get the desired consistency. Check to see if you can make a ball out of the thicken Khoya, else keep stirring with medium-low heat until you get the right consistency or simply add some milk powder to it. 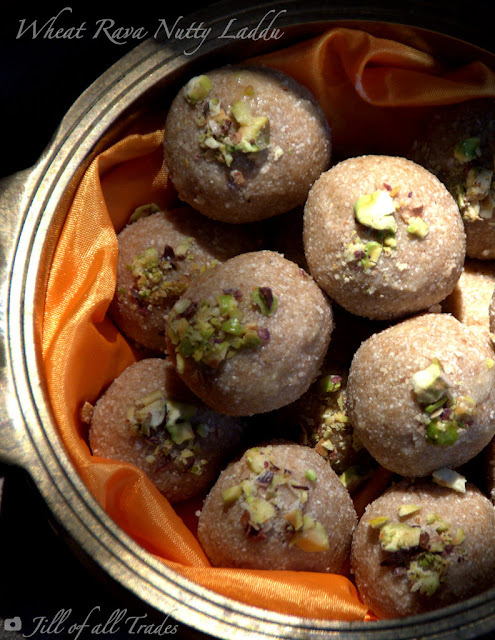 You may apply some ghee to your palms while kneading the peda dough. To shape the pedas, I used some of my kitchen tools like wooded spatular's end, bottle cap, straw and even tooth prick. You may also use cookie cutter or simply make a handmade disk shape and use forks to make any desired design. Laddus are always tempting. How about a healthier version that's easier and rich with flavor? Rava laddu made with wheat and nuts can be made by anyone. Yes, even a newbie to kitchen can give this recipe a try. It's that simple with very few ingredients and tastes yum! I love the texture when using wheat rava instead of the wheat flour. This recipe is perfect for a last minute sweet for any occasion! In a pan add two tablespoons of ghee and roast all the nuts together, once they turn golden brown remove from heat and set aside. Using the same ghee left in the pan add the wheat rava and fry well for close to 10-15 mins (depending on the size of your rava) in medium-low flame. Its important to keep stirring to roast evenly and to prevent from any burns. Once the raw smell leaves and the sweet roasted rava aroma arises, keep the flame in low for couple more mins for extra roasting and then turn the flame off. Let cool to transfer the rava in a dry mixer with nuts, coconut and sugar and grind them together. Do not grind to a fine powder, just to maintain the slightly coarse crunchy texture. Now add the cardamom powder and pulse it twice to mix well. Add the other one tablespoon of ghee to this mixture and mix well. You may apply little ghee to your palms to make lemon size balls. I have dipped these balls slightly in the ghee for the pistachios to stick well on to the laddus for decoration. If texture doesn't matter you may opt for wheat flour for even simpler version. That way only the nuts and coconuts will have to be grinded. Store it in an air tight container for one week at room temperature. Refrigeration is not required. Do try this recipe and send in your comments! Enjoy cooking and eating! Diwali (Deepavali), the "Festival of Lights" is just around the corner. Its the biggest and brightest Hindu festival in India. How about we enjoy some of the authentic sweets and savory? The first sweet that came to my mind is Badhusha, my all time favorite. Badhusha is similar to a glazed doughnut in terms of ingredients, but differs in texture and taste. My Mom is an excellent cook especially with her authentic South Indian dishes. She passed this recipe to me about 10 years back and I have been making and enjoying it since then. These disk shaped Badhusha's are hand shaped then fried in oil and drunked in thick glossy sugar syrup. It's slightly crispy and glossy on the outside with soft flakey middles. Many think its complicated but not when you try this recipe. You can never go wrong if the ingredients are measured rightly. In a bowl mix the yogurt, sugar, ghee, baking powder, baking soda and salt with a spatula in a circular motion in the same direction until it turns creamy and butter like. Slowly add the maida in two batches to the above and continue the same method of mixing. It will start to look like crumbs (This will add the flakey layers inside once they are cooked). Now sprinkle about a tablespoon of water or less to knead it to form a soft dough. Highly recommend to knead for close to 10 mins. Divide the dough into small lemon sized balls and set aside to rest for 10 mins. Now its time to start shaping the Badhushas. You can simple flatten with a small dent in the middle (like mini doughnuts) or make decorative ends swirl. Click here for a video to make ends swirl by Raks Anand. In a separate pan to make the sugar syrup, add the sugar and water to bring it to a boil stirring occasionally until it turns in a think syrupy consistency. To this add the lemon juice and saffron strands. In another pan or kadai, add the required oil for frying and heat in medium high. Always test with a tiny piece of dough to see it rising immediately for the right temperature. Now add the shaped Badhushas in small batches and once they all rise up set the flame to low for it to cook with the preheated oil itself. This method works well for the inside to cook throughly. When it turns light brown, flip it to the other side. Once the bubbles reduce remove it and drain it well to put them in the sugar syrup immediately. Leave it for few mins and flip to the other side as well. Now drain the excess syrup and transfer them to a parchment or foil lined tray to avoid sticking. You may decorate it with desiccated coconut, silvered almonds, or chopped nuts. Enjoy making and tasting !!! Make sure your dough is smooth and soft enough else it might crack easily. If your badhusha's dissolve in oil, add some flour to the dough and knead again. On the other hand, if they are hard you might have to add more ghee or oil. Lemon juice is added to the sugar syrup to avoid crystallization. Badhusha's are always best when it cools completely. Never refrigerate, its good to store in a clean container in room temperature for about a weeks time. Hello Readers! A warm welcome to my space as I have just started my journey with my very first blog! If you are looking for awesomely rich chocolatey flavored Brownies, you are on the right page. You will instantly fall in love with these sinful brownies from scratch. For convenience I used to buy a good box mix brownies but not after I tried this simple recipe thats quick and easy to bake and also tastes amazing. I like my brownies with chocolatey fudge middles and a shiny candy-like flakey crust. You must give these brownies a try. Needless to say, they were a big hit when these warm brownies are paired with a scoop of vanilla ice cream or whipped cream topped with fresh raspberries. I am sure you would relish it as much as we do... Have fun baking and enjoy these dangerously delicious brownies! Preheat the oven to 325 degrees F (163 C) and position the oven rack in the lower third of the oven. Use a square baking pan lined with parchment paper or aluminum foil. In a large bowl combine melted butter, sugar, vanilla extract, cocoa powder and salt to whisk using a wire whisker. Add the eggs one by one and whisk for the above gritty mixture to smooth out until it turns thick, shiny and creamy. Now gently fold in the flour, using the silicon or rubber spatula scraping the sides to avoid any flour pockets. Transfer the batter into the prepared baking pan and smooth the top with a spatula. I also like to tap the pan on the surface couple of times to avoid any air pockets. Bake for 30-35 minutes or until a toothpick can be inserted into the center and come out with little moist crumbs. Cool completely to remove from the pan using the parchment paper / aluminum foil as a single piece. For cleanest lines when cutting, dip a thin knife in hot water and wipe off the water to cut each time. Line the baking pan with parchment paper or aluminum foil, leaving an overhang on two opposite sides for easy lifting when the brownies are cooled. I like some buttering in between for the parchment to stick to the pan itself, as this makes the brownies pop out right out of the pan easily. The brand and type of cocoa powder will determine your brownie color and flavor. I personally would recommend and have used Dutch Process Cocoa powder for a rich and dark chocolatey color. You may use Natural Cocoa powder for a red chocolatey color. This is a straight up Brownie recipe, but you may add 1/2 cup of nuts like walnuts or pecans for some crunch or even some chocolate chips for more chocolatey flavor. If you like a warm brownie, let the the brownies cool for just 8 minutes and cut to serve warm.